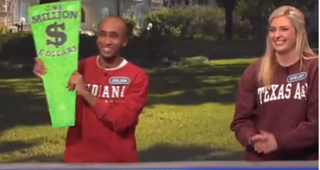 Indiana University freshman Julian Batts appeared on ABC’s Good Morning America on Monday to discuss an unfortunate string of answers on Wheel of Fortune that cost him a chance to win $1 million, a car and a trip to Jamaica. Although Batts eventually won the game on the show that aired Friday, collecting $11,700, his mistakes cost him plenty. When a contestant solves a puzzle, they must do so using “the generally accepted pronunciation,” Wheel of Fortune said in a statement to ABC News. “I don’t think anyone has ever taken a more circuitous route to victory, but the important thing is you’re here and you’ve got $11,700, and we’re pleased about that,” the show’s host, Pat Sajak, said during the episode.